Genesis 1:26-27 begins the story of Adam and Eve. "Then God said, "Let Us make man in Our image, according to Our likeness; and let them rule over the fish of the sea and over the birds of the sky and over the cattle and over all the earth, and over every creeping thing that creeps on the earth. And God created man in His own image, in the image of God He created him; male and female He created them." The date of Creation is debatable. Flavius Josephus puts it at 5555 B.C. The Septuagint places Creation in 5270 B.C. Other dates include Kepler in 3993, Luther in 3961, Lipman in 3916, and the Jewish date of 3760. The best-known system based on Biblical data is that of James Ussher. Ussher ( 1581-1656 ) was the Archbishop and a prominent scholar of his time. He places Creation in 4004 B.C. Isaac Newton subscribed to Ussher's date. In his detailed study of chronology, The Chronology of Ancient Kingdoms Ammended, questions the legitimacy of the ancient Egyptian claim that the 1st Dynasty originated before 5000 B.C. Up to the 18th century, it was generally accepted as fact that the human past did not exceed beyond 6000 B.C. The first thing one will notice in the story of Adam and Eve, is God uses the words "Us", and "Our", in describing who created man. Some have suggested God is talking to His angels, however, this is in direct contradiction to the Bible. Share Your Thoughts on Adam and Eve! Do you believe God created two women in the Garden of Eden? What were the effects of the Tree of Life? Share your insights, questions, comments, and thoughts on Adam and Eve! 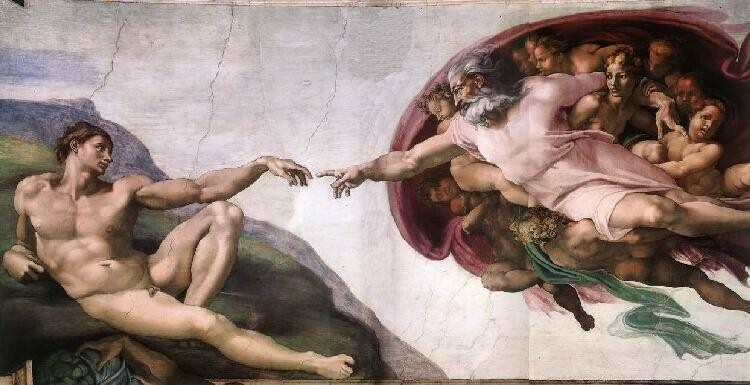 MICHAELANGELO'S DEPICTION OF GOD CREATING ADAM & PLACING HIM IN THE GARDEN OF EDEN. Man was made in God's image, not the angels. Secondly, God appears to create man and woman simultaneously. The first mention in Genesis 1 leaves out all mention of Adams rib. God is having a conversation with Himself, as one member of the Trinity to another member, or members. A similar passage is found in Isaiah 48:16. "...From the time it took place, I was there. And now the Lord God has sent Me, and His Spirit." Thus, Adam was crafted by the fullness of the Triune Godhead, and it was in this fashion man was made in the image of God. As one continues to read, a second account of the creation of man appears in Genesis 2:7. In this account of the story of Adam and Eve, God clearly is in the singular in His creation. The account goes into more detail concerning man's creation. And he is created alone. It is only in verse 21 that God causes man to fall asleep, and creates woman from his ribs. These two accounts seem to be different accounts of man's creation. In fact, theories exist which state just this. Some say the story of Adam and Eve is really a story of Adam, Eve, and another woman, one first created in the Genesis 1 account. This woman has been named Lilith. The Midrash recognizes two separate accounts of the story of Adam and Eve. Early rabbis attempted to explain the apparent conflict by explaining the first creation involved Adam as a hermaphrodite. In this sense, Adam was both physically and spiritually male and female. Other ancient Rabbis endorsed the view of two separate females, Eve and Lilith. In Mesopotamian mythology Lilith is a female storm goddess. She associated with the wind, and was believed to have brought disease, plague, and death. She appears in Mesopotamian lore around 4000 B.C.E. Lilith is mentioned in the Bible as well. In Isaiah 34:14, Lilith is described as a "night monster". Interestingly enough, Isaiah associates Lilith with the "hairy goat" demon. This demon was Azazel, associated with the Day of Atonement in the Books of Moses. The most likely explanation is the passage in Genesis 2 simply further develops the brief mention in Genesis 1. The story of Adam and Eve is developed in more detail in the second passage. Indeed, this is the most agreed upon theory by serious scholars and theologians, and appears to fit in context with the rest of Scripture most accurately. The story of Adam and Eve starts with God's physical act of creating man. Scripture tells God formed man from the "dust of the earth". Thus man was to be formed from the basic elements which form the earth; hydrogen, oxygen, nitrogen, calcium, etc. The Hebrew word for earth, or ground, is Adamah. This is where the name Adam comes from. This fact was not lost on Paul in his first letter to the Corinthians ( I Cor. 15:47 ). In this passage, Paul claims the first man, Adam, came from the earth. He was "earthy", meaning, of the dust. However, the first act in the story of Adam and Eve was not the final act. The body of dust needed energy. It was only after God's second physical act that man became alive. Though our bodies come from the earth, our life comes from God, and it is His breath that makes life sacred. God's breath gives man life in Genesis, and in Revelation 19 it is the sword out of His mouth that strikes down the nations. It was this breath from God that lent man the exclusive privilege of being created in God's image. "And the Lord God...breathed into his nostrils the breath of life; and man became a living soul." This breath of Life is shared with the animals. However, it was the method by which man and animal was brought to life which separates them. whereas with animals, God simply spoke them into existence, with man, He directly imparted the soul of life through His Breath. Man's soul was of a much higher order. It required God taking direct action to bring to life. God literally breaths life into Adam's nostrils. 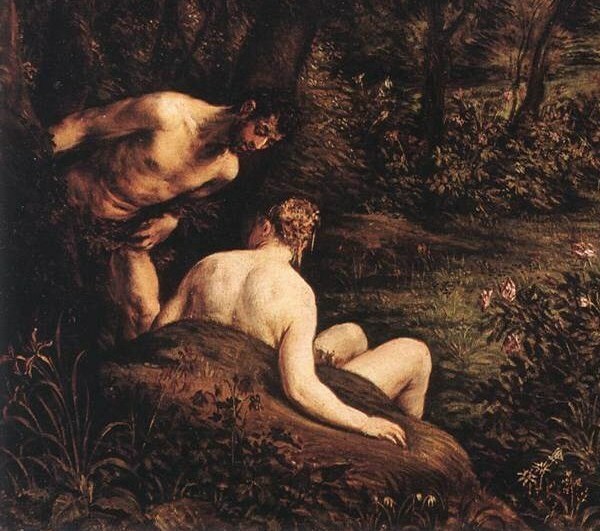 It is often assumed the story of Adam and Eve starts in the Biblical Garden of Eden. However, a close examination of the text in Genesis reveals Adam was created somewhere outside of Eden. 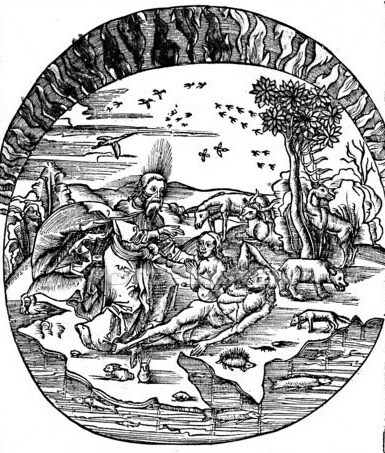 The Garden of Eden location has been a subject of much speculation for thousands of years. Recent technology has allowed the analysis of satellite images, and scholars have traced what used to be two rivers which run from the mouth of the Persian Gulf. These two rivers would have merged with the Tigris and Euphrates, painting a picture tantalizingly similar to the descriptions given the location of the Garden of Eden in the Bible. Interestingly, they theorize the Biblical Garden of Eden once existed where the Persia Gulf rests today. Regardless, the story of Adam and Eve started outside of Eden, and Genesis 2:8 gives us the general direction. It is reasonable, then, to assume that Eden was created east of Adam's location at that time. The exact location of Eden is impossible to determine, as the world before the flood was completely different, both environmentally and geologically, than the world after the flood. What is certain is that Eden was a spectacular sight, abounding with trees and fruit from the very hands of God Himself. Adam was placed in the Garden by God, "to work it and take care of it" (Gen. 2:15). It was man's charge to see after God's creation. "And the Lord God planted a garden toward the east, in Eden; and there He placed the man whom He had formed." God had not created the earth out of idle boredom. He had a plan. Eden was not in the initial phase of creation, because He was reserving it for Adam. Eden comes from a word meaning, "Delight". God had planted numerous trees in the Garden, of every kind and type. Genesis 2:9 specifically mentions two trees; the tree of of life, and the tree of the knowledge of good and evil. A fascinating description of the tree of life is given in Revelation 22:2. "And on either side of the river was the tree of life, bearing twelve crops of fruit, yielding its fruit every month; and the leaves of the tree were for the healing of the nations." The tree of life is a tree of healing. Perhaps God placed His own healing power in the fruits of this tree. The story of Adam and Eve was to take place in the midst of this tree. They were allowed to eat freely from its branches. Man's spirit would have been regenerated by this tree. Many scholars believe this tree was the tree of immortality for man, enabling man's body with God's power. It is interesting this tree will line the streets of the New Jerusalem, and will bring healing to "the nations". The second tree involved in the story of Adam and Eve is much more dubious. This tree was the tree of the knowledge of good and evil. Genesis 2:16-17 gives God's command concerning this tree. "And the Lord commanded the man, saying, 'From any tree of the garden you may eat freely; but from the tree fo the knowledge of good and evil you shall not eat, for in the day that you eat from it you shall surely die." God had directly told Adam he was not to eat from this tree. Thus, it was the man's responsibility to clearly convey this notion to Eve. Adam was in direct knowledge of God's command. The blame in the story of Adam and Eve is oftentimes put on Eve. Adam, however, was the initial receiver of God's commands. Genesis 3:6 described this tree as being "good for food, and that it was a delight to the eyes". This was an especially enticing tree, one not only pleasing to the taste, but to the sight as well. "Then the Lord God took the man and put him into the garden of Eden to cultivate it and keep it." The word translated as, "keep", literally means to "guard". Adam was to guard the Garden of Eden. This does not mean from outside threats, as none existed. He was to see the well-being of the Garden. He was to maintain the Garden, and its harmonious relationship with nature. Adam was to be the overseer of his garden, as God was the overseer of His Garden. 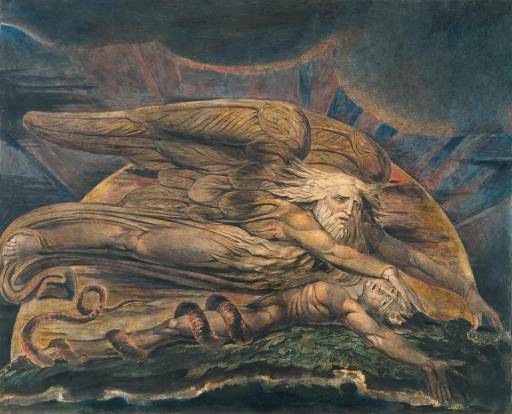 Adam, thus, was a reflection of the image of God in his toil as well. The story of Adam and Eve was meant to take place in its entirety in Eden. "I will make him a helper suitable for him." One would logically assume Eve would be the next act of creation on God's part. However, Genesis 2:19 says different. "And out of the ground the Lord God formed every beast of the field and every bird of the sky and brought them to man to see what he would call them..."
Instead, God seeks a suitable helper for Adam from the animals. Scripture relates, "but for Adam there was not found a helper suitable for him." God's next act of creation, would be that of Eve, the suitable helper and companion for Adam. The Apocalypse of Adam is an ancient gnostic text dating from the early first or second century A.D. It relies heavily on Jewish apocalyptic tradition. The Apocalypse of Adam depicts Adam as handing down revelations he had received to his son, Seth. Seth, in turn, was responsible for its preservation. Though it contains no Christian themes, this gnostic text is an important work in understanding the different sects and religions of early Israel. Click on the link below to re-direct to Amazon.com and receive The Apocalypse of Adam! Do you have a unique take on Cain and Abel? Perhaps you know what the mark of Cain was? What do you gleam from this story? Share your thoughts, comments, and questions on Cain and Abel here!